Cloth Paper Scissors "Create" Art Retreat... Here I Come!! ....got my crayons and I'm ready to create!! I'm so excited I can't sleep tonight! 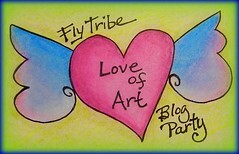 Tomorrow I will be flying to Chicago to attend the Cloth Paper Scissors "Create" Art Retreat. This is the first art retreat that CPS has held and there are lots wonderful art instructors teaching at the event! I'm taking "Making Fabric Paper & Beyond" with Beryl Taylor, "Beyond the Vintage Metal Deck" with Leighanna Light, and last but not least, "The Trashy Clutch" taught by Alisa Burke. There are so many neat workshops offered it was really hard to choose which ones to take (60+ workshops)!! There will be a casual mixer the first evening so we will get an opportunity to meet other class participants, instructors, and of course some of the Cloth Paper Scissor staff. Then a vendor night on Friday evening. The workshops go through Sunday, but I will be leaving Saturday morning. Even more exciting is the fact that I will be meeting my oldest daughter, Monica, who will be flying in from Kansas City, Missouri !!! It's been several months since I last saw her and I miss her terribly. We always have lots of fun together, so I'm really looking forward to spending four days of arting and fun!! Sure wish my youngest girl, Natalie, could have come too, but today was the first day of fall classes at BSU. I'll take lots of photos to share with all of you when I get back!